A dear friend of mine is going to be a grandmother. She wants the child to refer to her as “Your Highness.” Another friend became a grandmother earlier this past week. And another friend has recently become a grandmother for the second time. Cajun Stitchery better start getting baby stuff in stock. 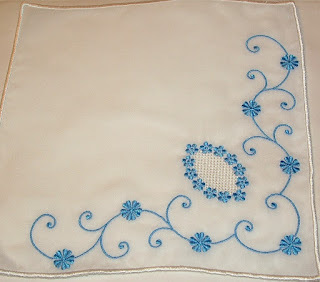 One of my friends has given me a baby blanket to embroider for her new grandson. I’ve been playing around with ideas for the monogram. She was so sweet and told me that it was up to me what I embroidered and how, but I still check with her. You never know if something that you think looks great may be something someone else doesn’t like. Around 9 a.m. one morning this week the phone rang. 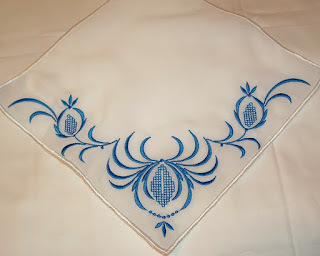 It was a lady who wanted some monograms on napkins. It turned out that she and her husband recently moved to Pensacola from Arizona. She is a sweet lady who wanted me to monogram some napkins for her sister. The monograms were done and she called to say that her husband would pick them up on his way home from work. Later in the afternoon she arrived at the door. When her husband got home from work she asked if he picked up the napkins. His reply was, “what napkins?” She was very pleased with the monograms and we became friends. One interesting project this week was a clock face. I wanted to change out the clock face on one of Mama’s wall clocks with an embroidered clock face with sewing notion designs. The embroidery turned out really nice. George took off the cover of the clock and the second, minute and hour hands. The new clock face fit perfectly inside the frame. Then George went to reinstall the 3 hands. Well, that didn’t work so we began learning about clocks. George is going out this week to get a new clock mechanism and we will finish the clock. It was fun looking through all of the clock face embroidery designs that we have and learning how to put clocks together. There is another clock of Mama’s that I’m thinking about embroidering a clock face and replacing the old. Who knows, we may be able to start selling embroidered clocks. 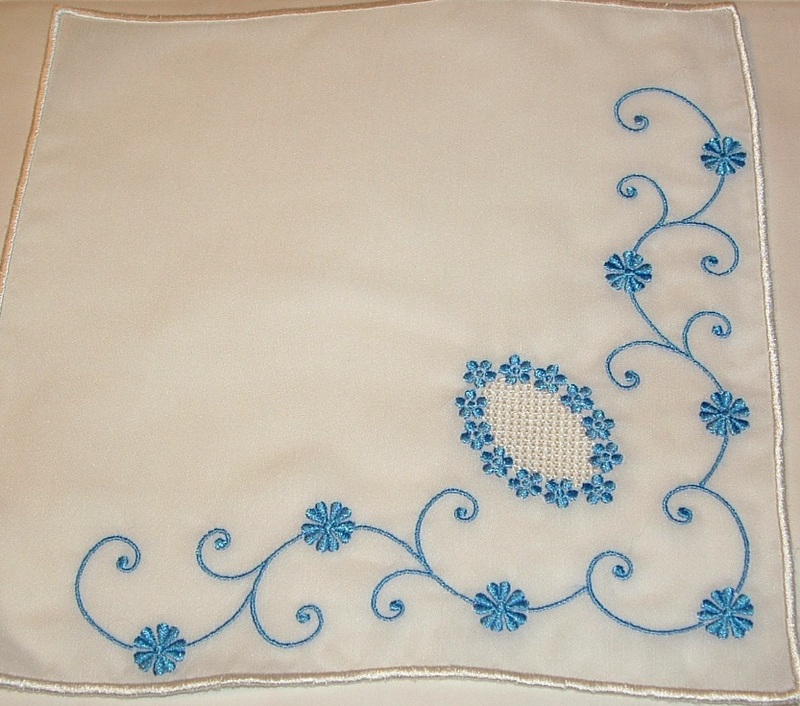 Just imagine a clock face with your monogram; or, we could embroider baby designs for a clock in a baby’s nursery. We were laughing this week because I must really be getting old. I noticed a box in the master bedroom and went to see what was in it. When I entered the room, I noticed some ball caps on the bed. I then picked up the ball caps to photograph them and list them on Etsy. I walked out of the master bedroom and as I passed the cutting room, I went in there because I had begun a project of making the horse embroideries into placemats. I saw in the trash basket a couple of pair of scissors that were dull and picked them up to take outside to use for gardening. As I walked through the kitchen, I noticed that I had earlier started to make myself a cup of coffee. So, I made the coffee and went outside with the scissors. We laughed because I’ve read this joke on Facebook only this was my life and not a joke. Thank you to everyone who so kindly replied to last week’s Cajun Corner concerned about Evie. The very next day she awoke just fine and has been her usual Evie since. I guess she just had a bad day. Memorial Day was declared a federal holiday in 1971. We now, designate this day to remember loved ones who have passed on, as well as remembering our service men and women. Flowers and flags are placed on graves in remembrance of them. Parades and dedications of memorials usually are part of the day's activities. Boy Scouts, Girl Scouts, local marching bands, members of the armed service, fire departments, police departments, and fraternal orders often march in parades and attend ceremonies to commemorate the day. Bet you thought I’d miss this/last week. We had company all weekend and I’m just now getting to Cajun Corner. We had an excellent weekend. Our embroidery tech arrived Friday evening. We ate pizza, caught up on what’s happening with each of us, and played a bit on Clothilde. Saturday she had a service call in Century but made it back around noon. We played more on the embroidery machine and did some maintenance before we went to a surprise birthday party. Sunday we really played on the embroidery machine. She had another service call in the afternoon. That evening we went to our favorite eatery, Paradise Bar & Grill, for dinner and enjoyed the Biscuit Miller Band from New Orleans while dining by the water. We introduced her to one of our island drinks, the Bushwacker. This morning she departed for home in Geneva, FL. She introduced me to a new development in embroidery…glitter sheets. They are used as vinyl lettering sometimes but she taught me to use them in embroidery. That girl is always watching my back. Her first response was, “The Nereids are going to love this.” Her second was “All of the Mardi Gras krewes are going to want this.” She left some scraps for practice and experimenting. This stuff can be laundered but I want to work with it a bit and test how well it launders before I blind you with bling. She is always answering questions for me but mostly we brainstorm together. It is so much fun figuring out how we can make certain embroidery ideas work. It isn’t always her teaching me. Sometimes I, too, have grand ideas that we share. She liked my in-the-hoop design for the 10” purse. Bless her heart. She travels all the time and is so passionate about embroidery but rarely gets time to sit at her own embroidery machine and do things she wants. I encourage her to make things on Clothilde. So, she made her own purse. 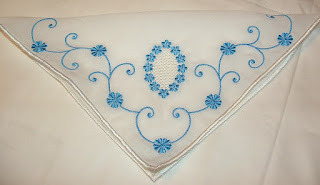 Another novelty that Cajun Stitchery does is to embroider with serger thread. Apparently, this is rare in the embroidery world. Most of the time I stitch at1200 spm with the serger thread. 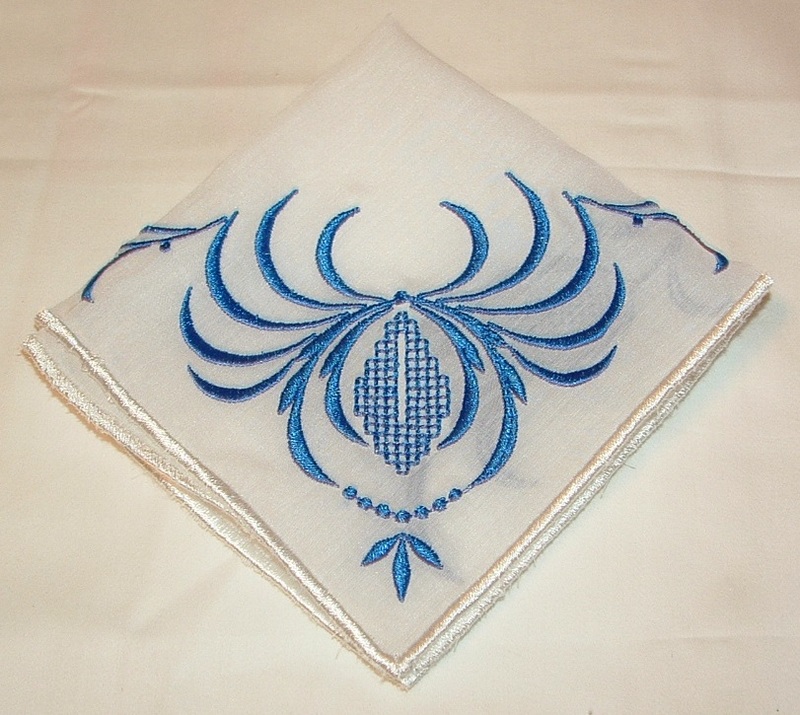 She found this so remarkable that she videoed the machine stitching out one of our heirloom designs at 1200 spm to show other embroiderers that it is possible. In addition, she loves to garden, too. We are always sharing gardening information and ideas. And did I mention that she loves Pinterest, too. Sadly, this morning Evie awoke and kept falling. She couldn’t get her rear legs walking. Dr. Armani told us last week that she does not have hip dysplasia but rather she suffers from arthritis. He suggested that we start giving her fish oil. She has been walking around all day. Her legs are moving but occasionally one trips the other up and she falls. We have an appointment with Dr. Armani in the morning. In the meantime, we got the fish oil and started her on it today. To be honest, we all started taking the fish oil today because it says that it promotes heart, circulatory and joint health. We can all use that. Sam was so good to Evie and refrained from trying to get her to play. Evie did want to play but when she would get out in the yard and try chasing Sam, she would fall. Please say a prayer for my sweet girl, who has been my shadow for many years. I read an article that even if you include credit to the webpage, you still are not supposed to copy and share other people's internet stuff and post on the internet. Therefore, the sewing and craft project that I usually share -- those that are not my own -- will only be shared in our weekly e-newsletter. It has been nice this week walking next door to work. Working in a large room with good lighting and lots of space to spread out is a dream come true. The creative juices are flowing. There is a separate room for cutting, sewing, and storage. George put peg boards up for my thread. The problem is that it is hard leaving and coming home. Last week we took the dogs for their annual check-up, shots, license, etc. They are both healthy. Sam is keeping Evie moving. She is in real good shape for a 13 year old Labrador retriever. The vet, Dr. Armani, was surprised at Evie’s good heath. He was more surprised at the size of Sam. The last time Sam was at the vet’s he was 40 pounds. He weighed in at a whopping 80 pounds last week. And, he is NOT overweight. Date night turned out to be Friday night. We got some Chinese take-out and a new movie and enjoyed the evening at the Cajun Stitchery house. The movie was the life story of Coco Chanel and starred Shirley McClain. I’ve always loved the rags to riches story of Coco Chanel. She was a very tenacious woman. I also like the clean lines of her designs, her little black dress, and what she did with jersey. While browsing through some designs, I saw some that I’ve never stitched and just wanted to stitch the designs. They were horses and created in black work. Several people commented on Facebook about how pretty the designs were. I think I’m going to make placemats out of them. In the meantime, I made some coasters out of one of the designs. While working on the coasters, I made some butterfly coasters. Not being able to upload my photos onto Etsy was very frustrating until I had the bright idea of trying to do it on Google Chrome. The uploading worked perfectly using Google Chrome. 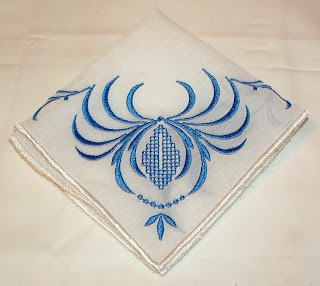 So, I decided to list the 2 new handkerchiefs. I got as far as the pictures and realized that I’ve already sold those hankies. I had nothing to list. Now I plan on listing the horse and butterfly coasters. I need to make more things to list in the Etsy store because we have had several sales lately. It never ceases to surprise me what people will buy. The “You Have A Booger” hankies still seems to be a hot item. George has been working on the lawn and garden and we are planning several fun things for the yard. Ever have a craving for a special food? George did. He was craving boiled shrimp. Yesterday he went to Joe Patti’s and bought 10 pounds of Gulf shrimp. Wow! That’s how much I buy when we have guests over. The shrimp were boiled and we ate our fill, and peeled the rest. We froze some and have some left over in the frig for snacking. These Bath tub scrubs are much like a body puff except these are for scrubbing the bath tub clean. Using your tulle lay it out flat and turn over a hem of 5 inches, keep folding it over in 5 inch sections till it is completely folded into a long 5 inch wide pile of tulle. Pin it to secure and using a strong thread sew the middle of the length together tightly. 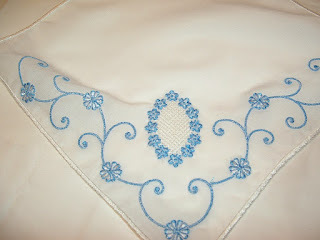 Cut the edges of the length to remove and folds and using a running/gathering stitch sew from one end to the other. Draw up the tulle into a puff that fits into your hand and secure with stitches. Pull the puff around to open up the layers and to create a nice circular puff. Trim it into a ball with some sharp scissors. Use this puff for cleaning and scrubbing your bath. This week we were emptying Mama’s boxes of other than kitchen stuff. We found that apparently we had a small hole in the roof of the garage and several of the boxes were ruined. George fixed the roof but the roaches were so bad in some of the boxes that we just opened them up in the yard. There was not much to salvage from those boxes and they were mostly clothes. The ruined clothes were tossed. Those Mayflower people really did box “everything.” We found a horrid looking brown substance wrapped up and it turned out to be chocolate kisses. That went in the garbage. The cookie jar still had cookie remnants in it. The medicine cabinet stuff was covered in bugs. That was tossed. We found Mama’s sewing machine and a lot of her sewing notions. It broke my heart but I did get rid of most of her scrap fabric. George reasoned that I already have a house full of scrap fabric, would I really use this? Darn logic. Mama’s towels and linens are being washed as I write this. The house started to become very dark with all of the boxes in there. Our plan is to have that house very bright and cheery. It will look better when I have the curtains finished and everything is put away. We finally decided that once we get all of Mama’s stuff in the house and put away, then we can decide how to decorate. I did make a sham for one of the pillows. It turned out beautiful. Then I discovered that Mama loved shams, too. She has lots of shams. I’ll just have to start embroidering on them. Several weeks ago we purchased some water bottle koozies that were on sale at one of my favorite online stores. Two of the koozies have pink feathers at the bottom. This week we sold those 2 koozies. The initials were embroidered on the koozies and they are adorable. We still have a bunch of the same color water bottle koozies and 2 beer bottle koozies in the same color, but no feathers. After embroidering the koozies, I decided to put a monogram in the same font on my shirt cuffs. Did that. Then I decided to monogram my tennis shoes. Oh, yes I did. Each shoe now sports a pink P. As long as I can get it in the machine, I can pretty much embroider on it. Yesterday George and I went to the Pensacola Crawfish Festival. We had a wonderful time. The line for crawfish was very long but moved at a pretty good pace. By the time we were at the front of the line, we looked back and the line was almost outside the festival entrance. Oh, that crawfish was good, sha. We each got a 3lb container of crawfish and ate every one of them while listening to band from St. Charles. Yes, it was messy but well worth it. Since we ate the crawfish we weren’t hungry for dinner. Later in the evening I made some beignets for us to snack. This morning I awoke with a bit of a queasy stomach. I guess it was overindulgence of spices and/or rich food. Again, it was well worth it. This morning was a baby shower for a friend. Because I wasn’t feeling very well, I cancelled. Now I’m sitting at the table looking at these cute little infant socks and wanting to embroidery the baby’s initial on the cuff. I don’t know the baby’s name. Perhaps the embroidery should be the first initial of the last name. The initial would have to be about a half inch tall but we definitely can do this. We have an order for a queen’s cape. Well, actually she is a little princess. The fabric is pink velveteen. I contacted my trusty tech on the hazards of embroidery on velvet and I think we are going to be able to do a very nice design. Thanks go out not only to my wonderful friend and embroidery tech, but also to all of my wonderful beach friends who are always directing potential customers to me. This customer was referred to me by two of my beach friends. Speaking of my embroidery tech, she surprised me this week by telling me that she will be here on the 19th of May. Whoo hoo! We always have such a good time and talk about gardens, embroidery, and conservation while imbibing our favorite wine. She is only staying one night but we will have a grand time. Poor Evie has been looking like a miniature, shedding, bison lately. She is 13 this year and the weather has been too cool to bath her outside. I have been brushing wads of fur off of her. Today she got a bath in a nice, indoor, warm tub. Even after her bath the fur was still flying but at least she is clean and silky soft. 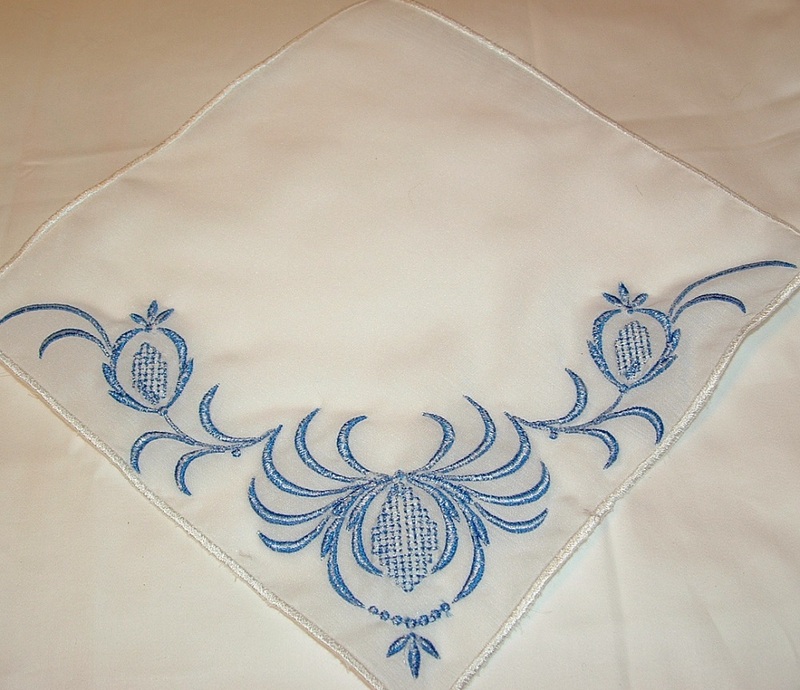 Two beautiful handkerchiefs were made this week. Pictures were taken. They were ready to be uploaded on Etsy when the computer gave me a message that they were not jpg files. Yes, they are jpg files. The “help” section gave the parameters in pixels. The photos were pulled into Paint and the parameters were adjusted. Etsy still won’t accept the photos. Facebook and Flickr accepted the photos but not Etsy. 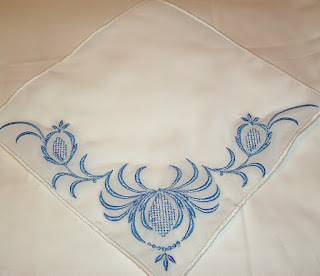 I just cannot seem to get these hankies uploaded on Etsy. They are beautiful and they are for sale. $10 each.